Germany has lots of Federal States (16 to be exact); each with its own history, flavor, and traditions. There are the sandy (yet rather fresh) beaches in the North, and, on the opposite, the (in summer) warm and (in winter) very snowy regions in the south. The federal based political system has been established after the Word War II. And that was just the start of considerable changes year after year. For example, a lot of old provinces and areas have been joined together to form a more stable, more “productive” joint venture, sort of. 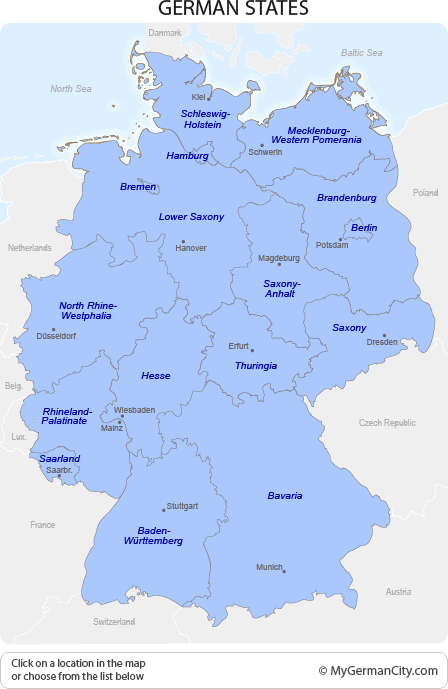 One example is Baden-Württemberg, which was formerly divided into Baden, Württemberg, and Hohenzollern. By the way, Baden-Württemberg is one of the country’s wealthiest states and home of popular German Car manufacturer such as Porsche, Mercedes, and Audi. Of course, not everything had been changed. For instance, city states such as Hamburg and Bremen are still as is. As I mentioned earlier, there are 16 federal states in Germany, and each has its own capital city. It all starts with the German city state of Berlin. Yes, Berlin is not only a city, and not only Germany’s capital, but a city state at the same time, too. Furthermore, you’ll find out that it’s the leader in artistic, political, and cultural life. Next, let’s go to Bavaria. Bavaria? Munich? Exactly, Munich is in Bavaria, it’s even its capital. In that state, you’ll find warmth, the Bavarian Alps, the Bavarian Forest, and lots more. Another state worth mentioning is Hesse (Hessen), whose capital is Wiesbaden, which is very close to Frankfurt am Main, THE financial metropolis of Germany (due to its exhaustive banking industry), if not Europe (since the European Central Bank is located in Frankfurt)! Brandenburg — Surrounding Germany’s capital (and capital state), Berlin, there’s still discussion going on as for merging those two states into one. Lower Saxony (Niedersachsen) — This state was founded in 1946 by the British military administration, who merged the former states of Brunswick, Oldenburg, and Schaumburg-Lippe with the former Prussian province of Hanover. Mecklenburg-Western Pomerania (Mecklenburg-Vorpommern) — Flat country, the Baltic Sea, the Mecklenburg Lakes, and among the least densely populated state in Germany. Lovely called MeckPomm for short, it’s another state that formerly existed as two states named Mecklenburg and Vorpommern. North Rhine-Westphalia (Nordrhein-Westfalen) — This is the largest German state, in terms of population. It has more than 18 million inhabitants and is influenced by its extensive coal mining industry. Rhineland-Palatinate (Rheinland-Pfalz) — Medieval castles, extensive wine regions, multi-color culture — this state is certainly a good spot for a relaxing Germany vacation. Saarland — This one is the smallest of German states in terms of population (only 1 million inhabitants). It was under French power (two times, I believe), and is rich in forests and scenic wine yards. Saxony (Sachsen) — Big-city stylishness and small-town romance, river valley and mountains, palaces and citadels, arts and skill, classical music and a sparkling bar scene, industrial architecture and industrial culture: Saxony has it all. Saxony-Anhalt (Sachsen-Anhalt) — Can you believe it? Saxony-Anhalt is 23 times larger than Berlin, but has less inhabitants? Only 2.5 million people live in this federal state, which is famous for having the best soil of Germany. Schleswig-Holstein — This is Germany’s northernmost state and has been controlled by Austria and Denmark throughout various points in history. Thuringia (Thüringen) — Thuringia is another state that is much larger than Berlin (18 times), but has less inhabitants. Only 2.3 million people enjoy their life in this east German state. Phew! Quite a lot, right? But that’s it for now. Now, go ahead and explore our German states thoroughly.